Aero Mexico www.aeromexico.com is the flag carrier airline for Mexico and the most recent to add Cuba to its over 58 destinations. With a fleet of 63, there were over 13,000 employees reported in 2014. Revenues in 2011 were reported as US 2.8 billion. If you have a problem with your Aero Mexico flight, call 1-800-237-6639. You may also find helpful Contact Us information here. To write to CEO, Andres Conesa Labastida, you need to address your postal correspondence envelope with United States Customer Care, 3663 N. Sam Houston Pkwy E, Suite #500, Houston, Texas 77032. You may also email communication to customerrelations@aeromexico.com. 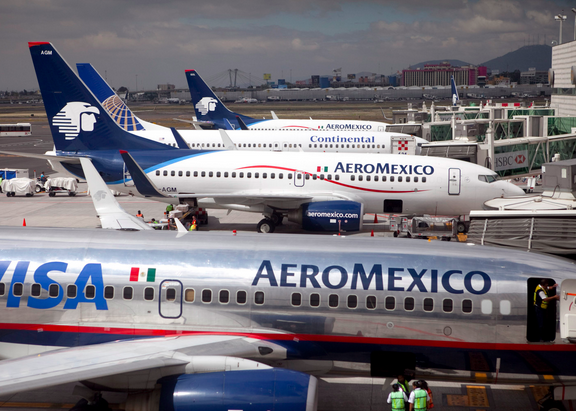 Founded in 1988 Aero Mexico slogan is ‘Mexico’s Global Airline’. Social presence may be found on Facebook, Twitter, Instagram, LinkedIn and Pinterest. Your email from April 7,2019 case # 00592629 You wanted more information here it is !!!! You should have had all this information on hand !!! MY CANADIAN VISA CARD WITCH COST ME $20 MORE BECAUSE AREOMEXICO TOOK ALL MY MONEY OFF MY US VISA CARD. I WOULD LIKE MY MONEY BACK FOR THE FLIGHT I WAS ALLOW TO TAKE AND THE FLIGHT THAT MY FRIEND HAD TO BOOK AND SEND TO ME BY EMAIL. THIS WAS THE WORST FLIGHT AND WORST CUSTOMER SERVICE I HAVE EVER HAD IN MY LIFE. NO ONE WAS WILLING TO HELP ME. PS: you have my first letter, I have the tickets, the screen shot my daughter took and any other information you my need. I WAS CHARGED FOR THE 3RD EXCESS BAG WHEN I WAS SUPPOSED TO OF BRING IT ON THE PLANE WITH ME.ALL IT HAD WAS SHOES AND SOCKS REALLY LIGHT.I HADNT TRAVELED IN ALONG TIME SO I WAS UNAWARE OF THE RULES OF THE BAGGAGE.I HAD AN EMPTY CABINET FOR MY BAG ON TOP OF ME IN THE PLANE BUT NO ONE TOLD ME TILL I WAS INSIDE AND I WAS IN THE AIR.IF YOU COULD PLEASE DESPUTE THE $180 CHARGE THAT WOULD B GREAT. There is a total lack of communication between your airport staff and the waiting public. advise us of a departure time. A long delay without any knowledge. with others had to wait while the whole plane boarded, then we were given our boarding passes to board and lost our original seats. The whole experience flying your airline was terrible,you Aero Mexico have lost two (2) customers. Hoy llamé Aeromexico para pagar dos maletas: Pero me equivoqué al pensar que estaba pagando para irme de Los Angeles a Mexico. Voy a cancelar una maleta de 50libras. Y solo quiero pagar una maleta que vale$30 y es de 50libras. Por favor pido my reembolso de $55. My confirmation es TJZJYG. Gracias por su ayuda espero su respuesta. I would to get a refund on my ticket from Denver to Mexico on 2 February 2019 and was supposed to return on 15 February 2019.
reason is on the way to the airport may ticket and passport was lost. Hope that reimbursement is possible. Thank you for your time. Hope to get an answer to this soon. JANUARY 10TH 2019, IN MY WAY BACK TO CALIFORNIA, I WENT TO VENTANILLA 18, THE LADY EMPLOYEE DIDN'T HAVE AN IDENTIFICATION TO SEE HER NAME. FLIGHT # 550 SCHEDULED TO DEPART AT 10;00AM TO MEXICO CITY FROM VERACRUZ. 6,000.00 PESOS, I WAS TROUBLE, THEN SHE SAID TO CHANGE CLOTHES FROM ONE LUGGAGE TO ANOTHER TO MAKE IT EVEN WEIGHT; AND THAT SHE WOULD CHARGE ME LESS, AND I ENDED UP PAYING 1,700.00 PESOS. I AM 72 YEARS OLD, MY KNEES ARE PAINFUL TO BEND DOWN AND TO GET UP, I WANTED TO CRY, SOMEBODY A STRANGER HELPED ME TO DO SUCH A CRAZY REQUEST, I WAS EXPOSING MY UNDERWEAR, AND EVERYTHING I DON'T THINK ANYBODY CARED TO SEE MY STAFF, BUT FOR SURE I DIDN'T WANTED TO SEE EVERYTHING IN THE FLOOR. ANOTHER OLD LADY COMING TO THE USA HAD THE SAME EXPERIENCE AND TOLD TO THIS EMPLOYEE THAT NO BODY ELSE WAS DOING SUCH A THING. SOMETHING ABOUT EMPLOYEES WHO ARE GIVING YOU A BAD NAME. I need to cancel this ticket reservation #WEPRGL due to emergency medical conditions. My mother Lucina Torres Zepeda it's been treated for an open wound and is waiting for surgery. I would like to get a refund, since we don't know if she'll be able to travel any time soon. Here's the doctor's medical letter. Any questions feel free to call me at 831-682-2041. I have attempted several times through Aeromexico, Expedia, and I was not able to book a ticket from Manzanillo and Vancouver. a- The payment by VISA would not accept my address in Canada or the Canadian postal code. b- The Aeromexico Booking in English page is in Spanish only also has no space for a province in Canada, it has states only. I flew Aeromexico (flight 664) from SFO to HUX on October 12. My trip was planned for 5 days of surfing. I was charged $150 USD, one way, to transport my board bag on the trip. When I arrived, I found my bag was still in SFO. The delay cost me 2 days of surfing, which meant that 2 of the 5 days were gone. That was the whole point of my trip. It took me 2 hours at the gate when we arrived to determine the bags were missing, then another hour on our the 18th to attempt to receive some sort of compensation at the gate at the HUX airport. I requested some sort of credit or refund, but was denied. Instead, I was issued a mastercard gift card in pesos, which would expire in 30 days. I explained that we were leaving mexico that hour, returning to the U.S. and would like it in US dollars. Instead, I was assured that I would be able to use/cash this gift card loaded with pesos. This is false and misleading information. I have talked to 2 bank managers at 2 separate banks, 1 money changer, who could not transfer the pesos off the card, to USD. Further, I have spent 1 hour on the phone with Amazon.mx, but nothing they offer will ship to the US. I contacted Aeromexico. they requested documents about everything, but I refused, and told them I only needed to respond with my ticket number for them to retrieve the information. They relented, so that was mostly a game. 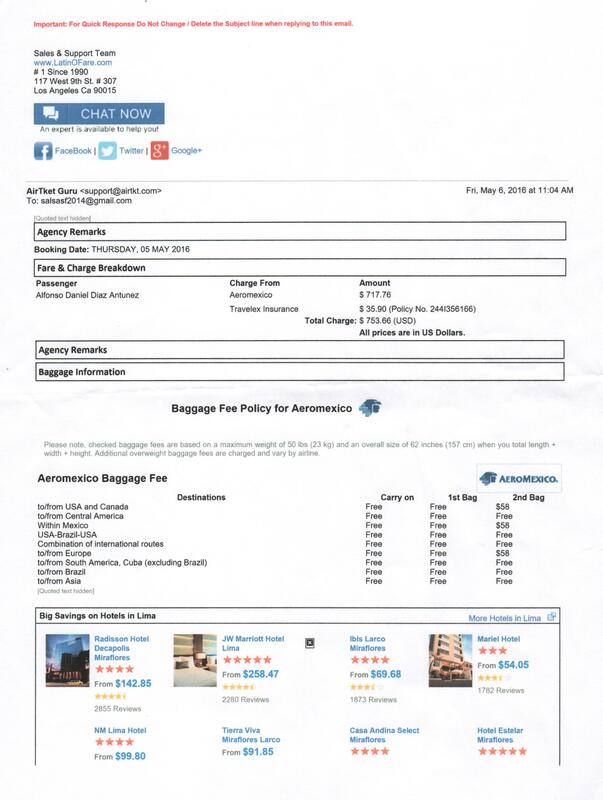 I spent many emails back and forth, with an agent a the AM luggage team, who dropped communication once I explained I have been given a worthless gift card that does not work. This has all the workings of terrible customer service. This is not unreasonable, to request compensation for a service not delivered. And further, thier fees are some of the highest in the industry for board bags. This partially ruined my trip, could have been dealt with professionally at the start by Aeromexico, and yet here I am spending more time on this matter. This is unacceptable at this point. Aeromexico does not care. I, Evelia C. Castaneda, is requesting the refund of a double charge of $55.00 to my credit card #xxxxxxx5363, claim #1391503682390 on October 10,2018. I was told at the airport on November 3, 2018 that I needed to pay the luggage again. Your system did not have it registered as paid. Needless to say, I did not have my receipt when checking in to board on November 3, 2018. Please take care of this error and refund my money to my credit card. If you have any questions about my request please contact me at 831-636-1459 anytime. I was on flight 534 Oct.12th from Merida Mx to Mexico City,,the flight should of landed at 430,it was over 3 hours late,missing almost all connections,i was lucky enough to get out on 2 hours later but missed my 8 oclock meeting I went for,i would like some kind of compensation for a waisted trip. mis hijas perdieron el vuelo de salida de ciudad de Mexico ( confirmación #ZIVOOI). por culpa del persona del aeropuerto en mexico. les pidieron a mi hernana quien las llevo al aeropuerto que hiciera una linea para el pago de la custodia de mis ninas y también que tenían que hacer otra linea pagar cada maleta ; cuando el ticket que compre en aeromexico fue viaje redondo donde pague incluido la custodia y las maletas y todo el tiempo paso y perdieron el vuelo a USA. mi familia llego con las 3 horas de anticipación. es una verdadera decepcion el pésimo servicio y necesito se hagan responsables. yo y mi esposa hemos estado horas hablando con personal del aeromexico y no tienen ninguna respuesta buena ellos dicen que en mexico deben solucionar este problema y que no tenemos que pagar nada de custodia y maletas porque todo ya fue pagado y esta en el sistema. en mexico dicen que debemos solucionar llamando a aeromexico porque ellos no pueden ninguna información que se haya pagado la custodia y maletas. porfavor necesito respuesta inmediata. mi familia tuvo que viajar de Oaxaca para poder llevar a mis hijas a la ciudad de mexico. cuando se va acabar tanta corrupción. ayuden porfavor. mis hijas prácticamente están solas en la ciudad de mexico 11 y 5 anos de edad. y todo implica dinero y mas dinero cuando los únicos responsables son ustedes. y apenas pudimos comprar esos ticket para mis ninas conocer a sus abuelos y familiares. It took over an hour to get my flight changed. In addition, I was told I can pay for the changed ( no show fee plus other fees) because I was not a noshow I requested a change of flight due to medical reasons. After I made the changes I received a call from amcomplaint@aeromexico.com saying my case was closed because I already spoke to soneone. It has not been resolved! I've tried to speak to someone and I cant! The service is beyond horrible! I spoke with an associate from Aeromexico 1 800 number. I asked if I was able to get a refund for my flight. She said yes, took my information and was transferring me to another department. Our connection was cut off. I called back and spoke to Liis, I believe, she also told me that I would get a refund and you would cancel my flight, but I would have to send my request to amcomplaints@aeromexico.com. There is no "s" in the email address so time was wasted there until I went back online to find the correct address. This was Feb 4, I was also told that my issue would be resolved within 72 hours. All I have received was an automatic reply to my email with this case number. 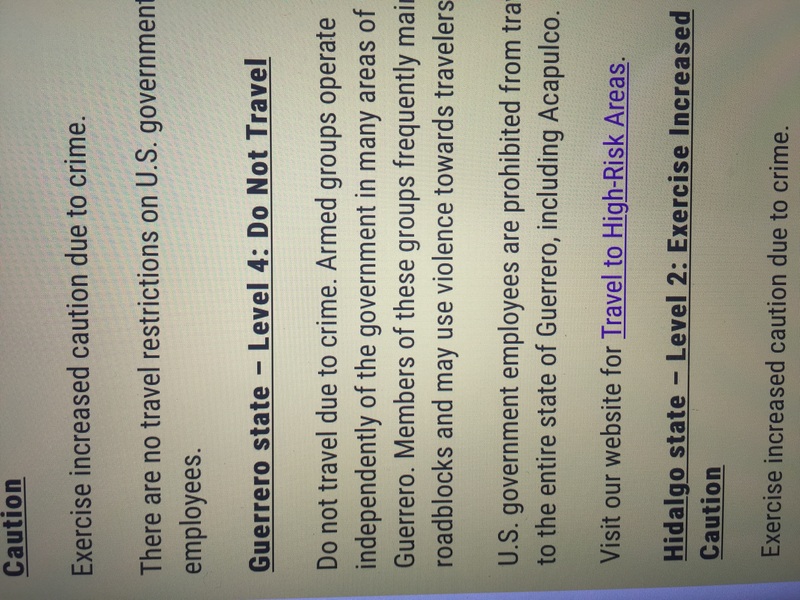 US has issued a level 4 advisory not to go to Acapulco Mexico- my flight was from Seattle to Mexico City (XYIBWO - 2/9-2/21/18) was booked on 8/14/17. 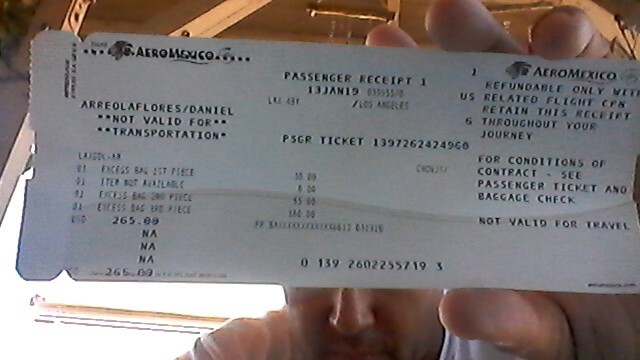 From there I was scheduled to take a flight on Aeromexico to travel to Acapulco. There was also a change in departure time from Seattle to Mexico City on 12/11/17- I should be able to cancel my reservation due to this reason without being charged anything for the cancellation. I bought insurance and I should be receive my money back. When I contacted Aeromexico I was told I could get a voucher to travel sometime within the next year and be charged an additional $100.00- this is not acceptable. I do not have plans to return to Mexico City. This has caused me a lot of stress- I am not sleeping well and I’m worried about my safety. I would like to summit a claim luggage numbers BJAM60683. I was told I would get a refund of $100.00 due to not receiving my luggage at my arrival. I lost my flight because of the connecting issues delayed they had. I was sent to LA and also the flight was delayed got to my final destination after waiting 12 hours and at my arrival they did not send my luggage. I paid $80.00 for my luggage and its unfair at my arrival did not receive it until 24hrs later. Please contact me with any further information and about my refund. If I could give customer service 0 stars I would. I’ve called three times and I got hung up on each time & my problem isn’t fixed by a problem AEROMEXICO made. I’m losing money and my time. On Sept 2, 2016 I booked a flight to Cuba for myself and my wife (Patricia Garcia) Shortly after this booking I became very ill with myelloneurpathy. Then on October 13, 2016 I lost my oldest son. I asked for an extension and was given a one year extension. My health is still very shaky and I'm still not in any condition to travel. I requested another extension due to my circumstances. I was denied the extension. Please reconsider my hardship case request for another extension. If that is not possible then allow me the opportunity to transfer this to a relative. Or even better I could use a refund due to all the medical bills I have incurred. Picture the scene - my partner and I have just got married, leaving two days later for the holiday of a lifetime in Mexico for three weeks. The holiday itself? Bliss. The journey home using Aeromexico as a carrier? Hell on earth! It was 30th August and we commensed our long journey home via Mexico City and Amsterdam to return to the uk. Bad weather meant Mexico City airport was closed for three hours resulting strangely in a 5 hour delay to our departure from cancun. This of course resulted in a missed connection to Amsterdam despite being assured by staff the planes would wait and there was no need to re book routes. Lie number one of about 700. We tried several attempts to work with Aeromexico to get earlier flights home. Three in fact. I send a email to customer relations about a month ago after 2 weeks they replied, but what they wrote made no sense. I replied, asking to speak on the telephone, with one of their representatives, but after more than 10 days and no one has called. 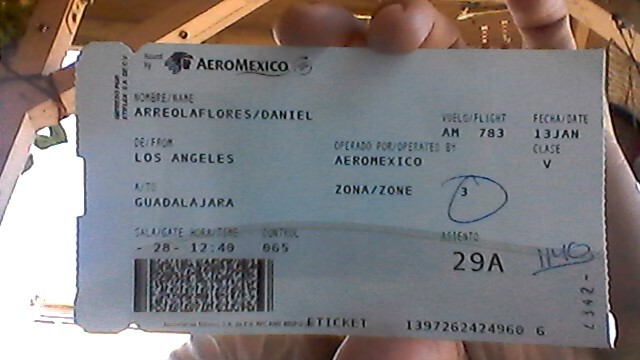 I had purchased an air plane ticket to round trip to Guadalajara, on the way there no problem, but on the way back. I had gotten to airport at 9:05 pm and my departure time was at 10:50 I totally understand I was late. But I do not think it was late enough to go aboard. I had purchased a protection plan, to cover any justified cancellation, since I had to take my mom to emergency. I would really appreciate you take it under consideration. I have been using this airline for years now and this is the first time I feel disappointed a about my last experience flying with this great airline. I became ill due to Flight attendants failed to provide water as requested, I missed my connection flight due to the illness caused by flight attendants not providing water, they charged me additional $412.54 to my credit card for the missed connection flight from Mexico City to San Francisco on 6/26/16, I originally paid $717.76 on 5/6/16 for the round trip originating on 6/11/16 in San Francisco California to Lima, flight connections are in Mexico City both ways. Aeromexico failed to provide water as requested on each segment of their flights itinerary on 6/11/16 & 6/26/16, I became dehydrated on 6/26/16 on the returning flight from Lima to Mexico City Flight #19, I filed a verbal complaint on 6/26/16 with Flight Crew Supervisor, on 6/27/16 by phone and email, Aeromexico send me an email on 6/29/16 with case #980293, stated that will investigate, on 8/2/16, Aeromexico Customer Services requested supporting evidence like a doctor’s note and flights receipts, on 8/3/16, I sent a doctor note stating that I became ill "dehydrated" on 6/26/16 and miss my connection flight, Aeromexico failed to refund the $412.54 charged on 6/26/16 and failed to refund the $717.76 charged on 5/6/16 for the entire round trip flight. I filed also a Dispute with my credit card Capital One Visa, I received a refund on 7/16/16 back to my credit card and on 8/9/16 $412.54 I was credited back to my credit card account. Aeromexico requested to my credit card Capitol One to rebill both charges of $717.76 on 10/24/16 $ $412.54 on 10/11/16, the rebill is over 60 days I believe this is a violation to my rights as a consumer by Aeromexico and Capital One Credit Card. I request an investigation and to refund both amounts the $717.76 & $412.54. 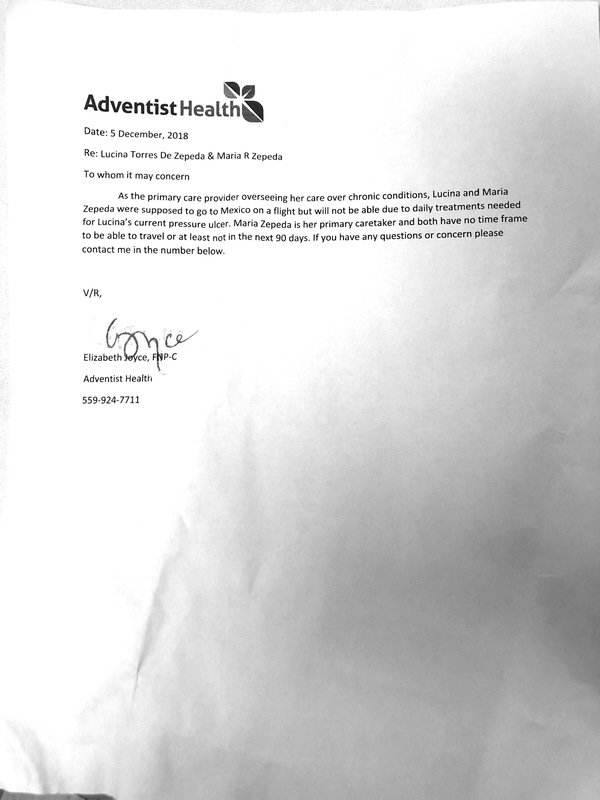 I became ill due to Aeromexico failure to provide water as requested during the flights itineraries and I sent the supportive evidence they requested, the Doctor note stating that I became dehydrated on 6/26/16 and thus, I missed my connection flight. I hope the US Department of Transportation can sanction Aeromexico for the mistreatment of a passenger. I flew yesterday from El Salvador to Mexico and Mexico to Los Angeles. I was supposed to fly in fly number 648 from Mexico to Los Angeles my fly was scheduled to leave a 6:15 from México. Do to costume check in Mexico i was delayed and i miss my fly. I arrived at the gate a 6pm. At the gate they told it was to late to fly. They sent me to buy a new ticket in which I ending spending $300. 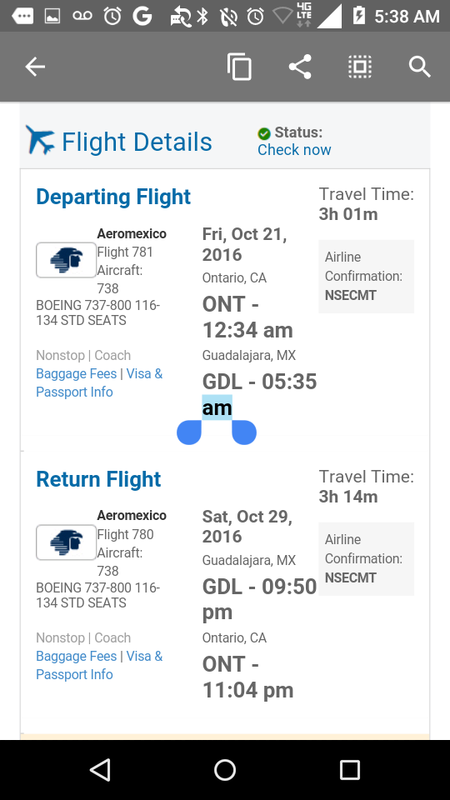 I need Aeromexico to give me back My money from the new ticket i had to purchased. I purchased a new ticket and my flight number was 630. I am very upset. The plain was still there and had to purchased a new ticket. Spend all the money. Just to travel back home. I am requesting a refund for the new ticket i has to purchased. Please a better crew to provided better service. The person directing me to buy a new ticket was very rude. I have a customer service complaint to report about my flight. 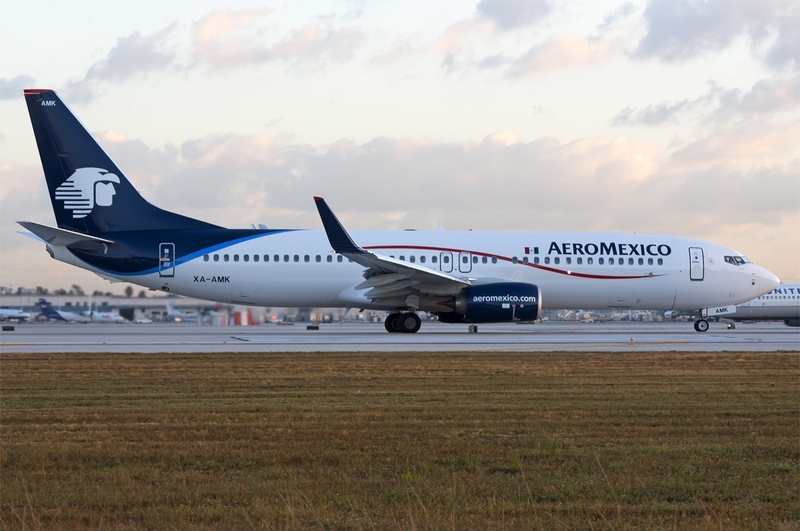 There was a theft from suitcase between Huatulco airport and Mexico city airport on AeroMexico and AeroMexico connect. My family and I were flying from Mexico City to Boston on Flight AM 698 last Sunday Feb. 21 2016. Our booking code is RVJHOE. We have flown several times to Mexico in the past years and have always had a pleasant experience. This was quite different. The first thing is the beverage cart collided with the food cart sending at least a dozen hot meals rolling down the aisle. It was quite a debacle. The flight attendants were clearly frazzled. I suspect they were very green and somewhat inexperienced. We were assigned to seats 23A,23B,24A, and 24B. By the time the food arrived to us, we had no choice but to take the cold dry pasta that was essentially inedible. Secondly, there was only one bathroom working and there was a constant line 10-12 deep waiting up to 20 minutes to use the one bathroom. It was uncomfortable having people standing waiting impatiently, while coughing and sneezing in the aisle. Since it was school vacation, there were many kids with cold-like symptoms spreading germs throughout the plane. Consequently, I ended up sick as well. The flight staff were really nice and patient, just visibly flustered trying to get through the long line to reach call lights. In short, the flight was relatively smooth, and staff very nice. I just felt it's worth mentioning since this is our 5th time in Mexico and have taken many Aeromexico Connect flights to Puebla, Puerto Escondido, Oaxaca, Cozumel, and Cancun. It would be a welcoming gesture to include a travel voucher to help compensate for our troubles and ensure future Aeromexico bookings. My signifant other and I booked a flight on Aeromexico for my daughters wedding in Tulum,Mexico leaving 11/9/2015 at 11:30p to arrive in Tulum by 1:00p the next day. The agent at the desk said to make sure to pick up our luggage in Mexico City. We got diverted to Guadalajara due to fog in Mexico City. Understandable. Fog lifted flew to Mexico City. Numerous people were put on a wild goose chase for our luggage missing our flight. We didn't get to our hotel till 8:30p November 10 missing the rehearsal dinner and other things that day preparing for the wedding. Our suitcase had a green arrow which means a connection. The agent should have told us. All along our luggage was waiting in Cancun our destination airport. So basically we missed out on 1/2 of our day at the hotel including the rehearsal dinner which is ALL very important and want to know what your plan is to compensate. No one knew what to do and just told us to go here and there and everywhere. I will be waiting for an answer to this complaint. Excellent service given by Aero Mexico. I was travelling from Miami to Mexico and used their services. Aero Mexico has employed friendly and understanding staff who catered to my needs while on board. The meals and entertainment on the flight was good and they didn't compromise on the quality of service. Aero Mexico has done a good job in giving quality service to me and I would definitely opt for their services next time as well.